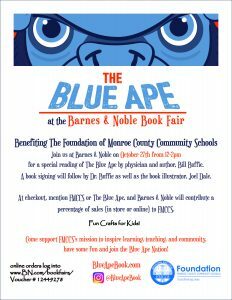 At checkout, mention FMCCS or The Blue Ape and Barnes & Noble will donate a percentage of sales (in store or online) to FMCCS. Purchases at Barnes & Noble on both Saturday and Sunday using the bookfair voucher code will apply toward our percentage. Start your holiday shopping early and support education.